Troparion (Tone 8): You came down from on high, O Merciful One and accepted three days of burial to free us from our sufferings. O Lord, our life and our resurrection, glory be to You. Troparion (Tone 8): Raised in virtue, O Father Theodosius, from childhood you loved the monastic life and attained your desire courageously. You lived in a cave adorning your life with fasting and radiance and abided in prayer like the bodiless powers. You shone like a beacon in the land of Rus’. Entreat Christ God to save our souls. Kontakion (Tone 8): When You rose from the tomb You also raised the dead and resurrected Adam. Eve exults in Your resurrection, and the ends of the world celebrate Your rising from the dead, O most merciful One. 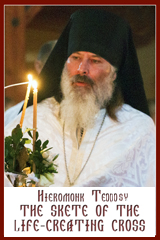 Kontakion (Tone 3): Today we revere the star of Rus’, blessed Theodosius, who shone from the east and came to the west; for he enriched this whole land and all of us with gentleness and miraculous wonders by the practice and the grace of the monastic rule. Prokimenon (Tone 8): Pray and give praise to the Lord our God (Ps 75:12). verse: In Judea God is known; His name is great in Israel (Ps.75:2). Prokimenon (Tone 7): Precious in the sight of the Lord is the death of His venerable ones (Ps 115:15). Brethren, we are God’s fellow workers; you are God’s field, God’s building. According to the grace of God given to me, like a skilled master builder I laid a foundation, and another man is building upon it. Let each man take care how he builds upon it. For no other foundation can any one lay than that which is laid, which is Jesus Christ. Now if any one builds on the foundation with gold, silver, precious stones, wood, hay, straw–each man’s work will become manifest; for the Day will disclose it, because it will be revealed with fire, and the fire will test what sort of work each one has done. If the work which any man has built on the foundation survives, he will receive a reward. If any man’s work is burned up, he will suffer loss, though he himself will be saved, but only as through fire. Do you not know that you are God’s temple and that God’s Spirit dwells in you? If any one destroys God’s temple, God will destroy him. For God’s temple is holy, and that temple you are. Brethren, remember your leaders, those who spoke to you the word of God; consider the outcome of their life, and imitate their faith. Jesus Christ is the same yesterday and today and for ever. Do not be led away by diverse and strange teachings; for it is well that the heart be strengthened by grace, not by foods, which have not benefited their adherents. We have an altar from which those who serve the tent have no right to eat. For the bodies of those animals whose blood is brought into the sanctuary by the high priest as a sacrifice for sin are burned outside the camp. So Jesus also suffered outside the gate in order to sanctify the people through his own blood. Therefore let us go forth to him outside the camp and bear the abuse he endured. For here we have no lasting city, but we seek the city which is to come. Through him then let us continually offer up a sacrifice of praise to God, that is, the fruit of lips that acknowledge his name. Do not neglect to do good and to share what you have, for such sacrifices are pleasing to God. 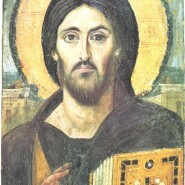 Alleluia (Tone 8): Come, let us rejoice in the Lord; let us acclaim God our Saviour (Ps 94:1). Alleluia: Your priests will be clothed with justice; your faithful will shout for joy (Ps 131:16). All things have been delivered to me by my Father; and no one knows the Son except the Father, and no one knows the Father except the Son and any one to whom the Son chooses to reveal him. Come to me, all who labor and are heavy laden, and I will give you rest. Take my yoke upon you, and learn from me; for I am gentle and lowly in heart, and you will find rest for your souls.